Chris Barton tells the remarkable story of Congresswoman Barbara Jordan, from her childhood in Houston through her time in politics to her teaching career at the University of Texas. He frames the story around her distinctive, powerful voice and reminds the reader of the difference Jordan made in the country. Gorgeous illustrations highlight the story of this outstanding public servant. For every school and library in Texas, as well as family bookshelves. Congresswoman Barbara Jordan had a big, bold, confident voice—and she knew how to use it! Learn all about her amazing career in this illuminating and inspiring picture book biography of the lawyer, educator, politician, and civil rights leader. Chris Barton is the author of many picture books including the bestseller Shark vs. Train, Sibert Honor–winning The Day-Glo Brothers, and Texas Bluebonnet Award Master List books The Amazing Age of John Roy Lynch (2016–17) and Whoosh! : Lonnie Johnson’s Super-Soaking Stream of Inventions (2017–18). His other books include Book or Bell?, Dazzle Ships: World War I and the Art of Confusion, and What Do You Do with a Voice Like That. He visits schools by the score and also loves speaking to professional gatherings of librarians, educators, and his fellow writers. Chris and his wife, novelist Jennifer Ziegler, live in Austin, Texas, with their family. For more information about Chris, please visit ChrisBarton.info. 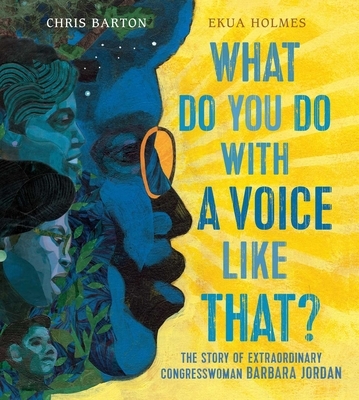 Barton introduces Congresswoman Barbara Jordan to children in this artful picture book illustrated by Holmes. Jordan grew up in Houston, Texas, and "stood out" because of "that voice of hers. / That big, bold, booming, crisp, clear, confident voice. It caused folks to sit right up, stand up straight, and take notice. "....Striking mixed-media illustrations capture the relationships between people and the influence of place. Barton's narration is colloquial, appropriately relying on rhetorical devices such as repetition and onomatopoeia to tell his tale. A moving portrait of a true patriot who found ways to use her gift to work for change. This oversize picture-book biography of Barbara Jordan, the charismatic congresswoman from Texas, takes a chronological approach, beginning with her childhood and college days. It then continues on through her political career, paying special attention to the role she played as a member of the 1974 U.S. House Judiciary Committee and the stirring televised speech she made to a national audience regarding the committee's recommendation to impeach President Nixon....The text features lyrical, inspiring language that will be easily accessible for young audiences, and a concluding time line fills in details (a bibliography is also included). The vibrant multimedia illustrations spill across pages, incorporating collage and multiple overlay techniques. When shared with groups, the bright, bold images will be able to be seen by all audience members, even those way in the back. The overall theme is that Ms. Jordan had a strong, compelling voice. Whether expressing her own beliefs or speaking out on behalf of others, she made sure that she was heard—and young readers are encouraged to do the same.